Allow around 375g beef per person, so for four people, you need a joint around 1.5kg, for six, 2.25kg, for eight, 3kg and for 10, 3.75kg. Massage the whole joint with olive oil or dripping and season lightly, all over, with salt and pepper. Put in a roasting tray and put in the oven. Cook at this high heat for about 40 minutes, until the meat is well-browned and sizzling in the pan. Turn the oven down to 180°C/gas 4, (leave the oven door open for half a minute to help it cool quickly). After the "half-hour-sizzle", allow 10-12 minutes per 500g for very pink meat, 12-15 for medium rare. Remove from the oven, put the joint on a warm plate or carving tray, cover loosely with foil, and leave to rest for no less than half an hour - this is very important - before carving and serving. 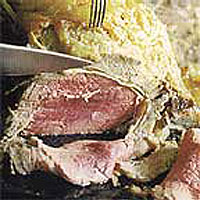 This "relaxing" of the joint makes a vital difference to the final tenderness of the meat. While the meat is relaxing, you can deglaze the pan, attend to the Yorkshire puddings, and finish off the roast potatoes. This recipe was first published in Sun Dec 01 00:00:00 GMT 2002.